(1) Check the temperature of the bearing. The temperature of bearing shall not over 60 ℃ (antifriction bearing temperature shall not over 70℃). Since the bearing is made of alloy, which is properly working under 100℃, if the temperature is over 60℃, please stop the machine and have a inspection to shot the problem. Inspection methods should be: if there has thermometer on the bearing, we can exactly read the current temperature, if there is no temperature for reading, then use hand back to touch on the bearing shell, if it is too hot to access and cannot be touched within 5 seconds, which means the temperature is over 60℃. (2) Check the lubrication system whether it is properly working. Listen to the sound from the oil pump and watch the oil indicator’s pressure. Inspect the oil tank’s oil level and to see if there is any leakage. (3) Check the oil circuit to see if there is any metal scraps, if has please stop the machine and check the bearing. (4) Check the connection of the bolts and fly wheels as well as the wearing situation of toggle plate and driving situation. If the discharge opening has been enlarged due to the wearing of the toggle plate, please timely change the opening size so that the crushed product could meet granularity requirement. The adjustment of the opening, please follow the scope demonstrated on the jaw crusher instruction manual. 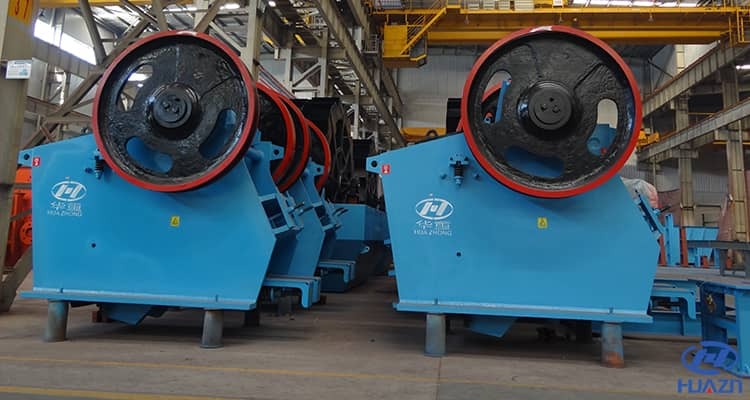 The size of the discharge opening means the distance between two different crushing plates. For measurement convenience, a sample could be made according to the size of the discharge opening. (5)Lubricant Filter needs schedule maintenance, dry it out before use. (6) Change the lubrication oil within the oil tank periodically. Since the lubrication oil will be exposed to the air and heated by it during using and the dust, moisture as well as other things will age the lubrication oil and let it lost the function of lubrication. So please reasonable choose the lubrication oil changing period.